What if I told you the food industry often puts labels on foods that are not only misleading, but some are outright lies? Well, sugar-free, low-fat, and fat-free often aren’t any of these. Take sugar-free for example. Just because a food is labeled “sugar-free” that doesn’t mean there is absolutely no sugar in it. The term sugar free actually means there is less than 0.5 grams of sugar per serving according to FDA guidelines. In my book, 0.5 grams of sugar is still sugar! So, if that is the case, then what does “no sugar added” mean? This is a product that already contains a naturally occurring sweetener just nothing has been added by the manufacturer to make it any sweeter. Another example, “all natural.” This food label is quite vague. You may think it means the food is healthy, but that’s not necessarily true. In fact, it’s not easy to even say what it means. The FDA actually doesn’t have an official definition for the use of the term “natural.” However, they do allow food companies to use the term if the food has no added color, artificial flavors, or synthetic substances. 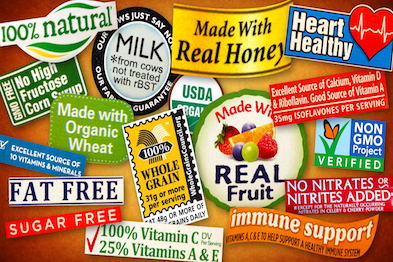 In the end my advice to you is when reading food labels remember that old saying, “caveat emptor.” Buyer Beware! Always read food labels with a certain amount of skepticism.